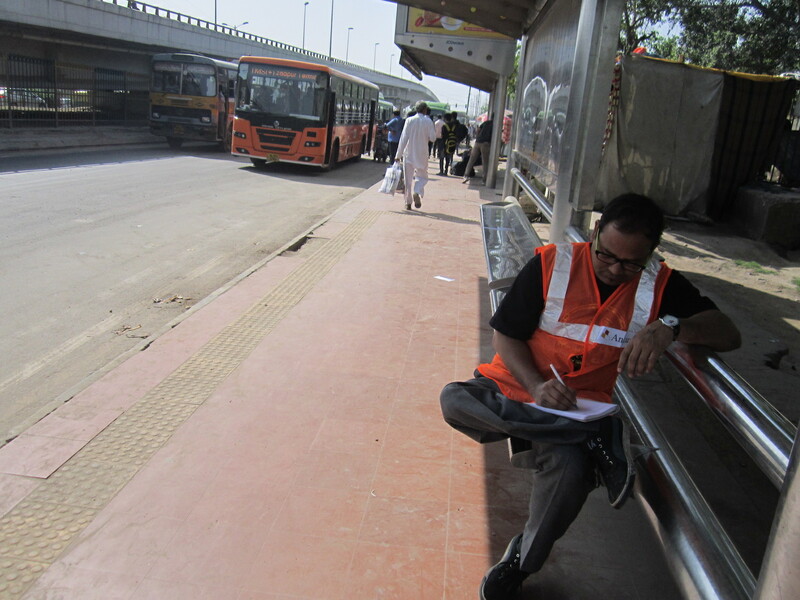 Listeners At Work in Dakshin Puri, New Delhi. Copyright: Delhi Listening Group 2013, CC 4.0 BY-ND-NC. Since 2009 Delhi Listening Group has fused social and aesthetic listening practices of social workers, educators and artists into a toolkit of ensemble creative research and experimental pedagogical practices which inform our work. Situated primarily in marginal neighbourhoods of New Delhi, in the context of a very fast changing urban environment; our practice explores shared listening as an alternative to the map and the plan as way of producing knowledge of the everyday city, and exploring shifting borders between sound and noise in ways that has often relegated the sounds of the margins to the categories of noise, via a refusal of listening. We are interested in contexts and spaces which invite people to listen to things they may usually take for granted, not notice, ignore dismiss or refuse to engage with. Listening is the work we do to generate dialogue between diverse ways of sounding and hearing a given corner of the metropolis. Our practice engages with the diversity of embodied listening positions that the politics of life at the margins of the mega-city engenders. Shared listening is at the heart of all our practices. We listen to the city, to many people and places; but we also listen to each other. The Delhi Listening Group ‘mehfil'(gathering) provides each of us a collective space where ideas, processes and texts will be carefully listened to and met generously with thoughtful questions. A polyphony of listening positions in the group helps each of us develop a more flexible ear. Social ecologies of listening are in transition. Spaces and practices of shared listening are vying for space with the apparatus of individual attention economies. Urban subjectivities are shape-shifting in the uneven fabric that global modernity weaves across new and changing city spaces. We seek to create new opportunities for shared listening in this context. The project Listeners At Work is a performative intervention to draw visible attention to the work of listening in a way that invites others to join us and turn a fresh ear to a familiar sonic space or to highlight how different kinds of everyday work in a locality involve specialised listening skills. Performative listening has always been a part of our practice. We can see a great deal about a person’s relation to the world by how they direct their listening attention to share with others. As well as this overtly performative listening, we became aware of ourselves as performing listening in the many public spaces where we have sat or walked to write or record in situ. The questions of how we mark ourselves out or blend in confronts us with the ethical question of how we state our intentions. This concerns us in marginalised and contested spaces where unusual behaviour – out of sync with the customary speeds and slownesses of that space – can make people nervous. But also, it informs our approach to hanging around in spaces that may be more or less friendly depending on one’s gender or socioeconomic status. Where you can loiter, and what you can listen to, depends a bit on who you are. Listeners At Work emerged from thinking about this aspect of our practice. In the first iterations of Listeners At Work we adapted paraphernalia of construction work to the task of announcing what we were up to. A yellow fold out sign and some orange high viz vests reminiscent of the workers on the city’s many building sites were adapted to make our listening action legible in public spaces of our localities. As creative researchers and educators we are not interested in providing a definitive expert interpretation of the city through sound, we want to proliferate the opportunities for hearing a diversity of listening positions. This simple invitation provided an accessible device for temporarily extending the permissions of various public spaces in a locality to invite a shared listening. This performative declaration provided a new set of invitations for people around us to get involved and to share their own active listening. For example, kids in the playing in the park became interested and started taking turns with the vests. With very minimal cues from our group they took on the task of performing their own listening for their friends who quietly shared a long moment of hearing their own park with fresh ears. This participatory element was also extended to highlight the many kinds of expert listening that operate in different domains. As we move through a locality, we find many skilled listeners specialised in the sonic or social listening dimensions of their work. The next phase of Listeners At Work opened a dialogue around the specialised technical and social listening that is part and parcel of many kinds of everyday labour. For example: The chaiwalla makes chai but they also listen. Not only to the sounds of their chai vessel that subtly indicates the condition of its boiling or the changing tone as a tea glass fills but also often to their customers. Especially in a context where people do not have access to psychological services this work of listening to each other, generously and fearlessly, is a social necessity. 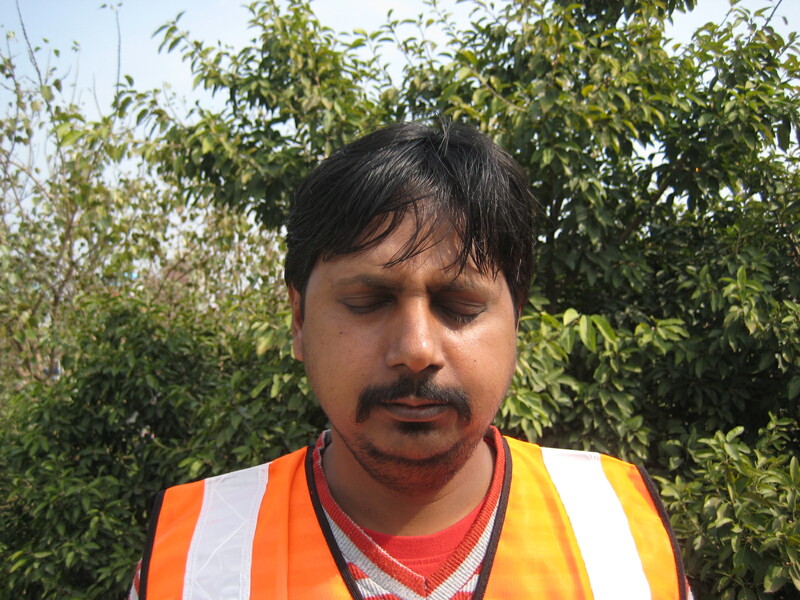 Our group has extended this performative and participatory set of practices to interact with the listening practices of various workers around the localities we inhabit and work in, as a platform to acknowledge and discuss the many kinds of specialised listening skills that are performed as part of the physical and social work that people do every day. Listeners At Work, is largely ephemeral. It leaves behind traces, documentation, photographs, texts & practices after the conversations have taken place around the performative interventions. It’s core purpose is not to serve up the sound world of this specific locality to an outside audience, but to open a space in which the locality listens to itself listening, for a moment, and affirms that the sound that is being made here is much more than noise, even if the centres of power in the city have rarely if ever listened to these places. सुनना कोई काम ठोस नहीं है लेकिन दिल्ली लिसनिंग ग्रुप तस्वीर, लेखन और मंचन की यादें अवश्य छोड़ जाता है। इसका काम मोहल्ले की आवाज़ को बाकि दुनिया में ले जाना भर नहीं है बल्कि मोहल्लों की आवाज़ के प्रति ख़ुद मोहल्ले को सचेत करना है ताकि मोहल्ला ख़ुद को सुने!